FractoForumInternational e.V. - Welcome to the Fracto Forum International e.V. Clinical Fractography will help to understand the relevant mechanisms in fractured dental restorations. 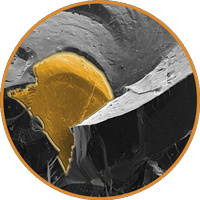 Improvements in design, processing and placement of restorations are expected from the fractographic insight. Fracto Forum International (FFI) is a new society focusing and promoting dental and medical fractographic research and education. Academics and Industry are very welcome to participate! Our annual Fracto Course has been re-organized. In 2019, a new 2.5 days course will take place in Erlangen, Germany. It will be organized by Susanne Scherrer, Ulrich Lohbauer, Paulo Cesar, and Renan Belli. Fractography is the science of reading fracture surfaces of materials. Fractographic methods are used to determine the cause of failure in engineering structures. In clinical dentistry, fractography is an essential tool assessing failure mechanisms. The Fracto Course will provide an introduction to fractographic methods in clinical dentistry. The participation is addressed to all interested researchers in the field. You will learn how to interpret and systematically approach a fractured structure or restoration. Welcome to the Fracto Forum International e.V. Fracto Forum International e.V. was founded in 2013 and is a non-profit organization focusing on Clinical Fractography. This website will guide you to the world of Fractography with the focus on dental biomaterials. You can find detailed information on our society, as well a guidance on how to become a member. Further we are conducting an educational workshop on an annual basis, teaching basic knowledge around fractographic techniques in Clinical Dentistry. We are continuously updating the latest research on clinical fractography and provide a list of books, standards, and scientific reverences. Welcome to our society and enjoy exploring our website!